Export your script in PDF format. In the top right corner, specify which Kindle you have, I for instance have Kindle Paperwhite, and the conversion mode should be left at default. Before you “Convert All Files”, you can preview the page by using the preview button in the bottom right corner (helpful for finding the perfect preference for your scripts). Once you’ve done all this and are happy, hit “Convert All Files”. It will create a new PDF out of image files that you can in turn send to your Kindle. Notes: Before sending the PDF to your Kindle, I suggest scrolling through it to check for any artifacts or obscure formatting and text sizes. 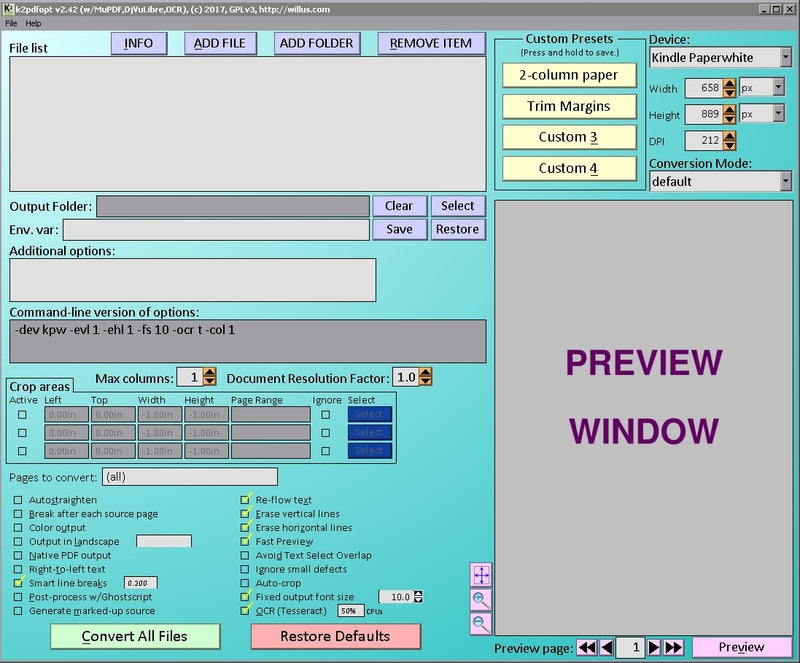 This can be adjusted by using the “fixed output font size” and previewing the pages you have with issues before hand. I’ve found 10.0 size to be the best for Kindle, sometimes it’s even okay with it off, but it’s bigger. If you have any compatibility issues when sending it to Kindle, you can run the new PDF through a program called Calibre. It’s a free program made especially for converting files to eBooks. All you need to do in it is import your new PDF, right click on it, select publish book > publish individually, and then specify what format to export it as (top right corner), and play with whatever else your heart desires.